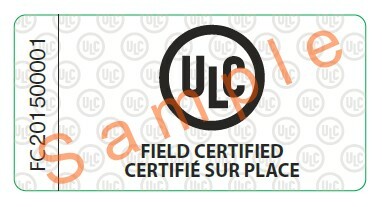 ULC’s Field Certification Service (ISO/IEC 17067 – Scheme Type 1b) accredited by Standards Council of Canada (SCC) is intended as a one-time certification of product(s) for a specific number of units or batch production and is not meant to be a substitute to regular product certification. This service offering is intended to provide the means for evaluating and certifying products in the field. The Product is tested to the applicable standard by UL technical personnel to determine compliance and products that conform to the requirements (including any additional jurisdictional requirements) are field certified and a series of serialized numbered labels are applied to the product by UL technical personnel. The labels bears the approved Certification Mark in accordance with the SCC Certification Body Accreditation Program (CBAP) Scope of Accreditation. This service may additionally be used where a UL certified product has been inadvertently shipped without the UL Mark or has been modified in the field and needs to be field certified. Field Certified products are not included in the UL Directory and there is no factory follow-up inspections. Underwriters laboratories of Canada Inc. is an Accredited Certification Body, accredited by Standards Council of Canada and conforms to the requirements of ISO/IEC 17065. Services of ULC are recognized by the provincial and territorial authorities in Canada.